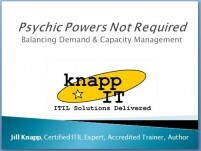 Five-day ITIL® “Foundation Plus” Training « Knapp I.T. Are you wasting your training dollars on boot camps? As the scope of the IT Infrastructure Library® (ITIL®) expands, more material gets packed into a three-day certification class. Unfortunately, this only leaves time for instructors to cover what is on the exam without much room in the schedule for practical application, meaningful discussion, or tying ITIL to real-world situations. Students may earn a certification, but what have they truly learned in three days? Knapp I.T.’s unique five-day approach creates a partnership between your organization and ours, providing your company a dedicated trainer/consultant, exercises which lead students to understand how applying ITIL practices can enable their organization, and provides students the necessary breathing room to actually absorb the material, use the vocabulary, and apply it to their workplace. In this five-day approach, students attend a kick-off session with your organization’s leadership, setting the tone of the course, followed by four days of classroom training. Training concludes with the ITIL Foundation certification exam, and a post-exam “real world application” session. Download the course outline for this exclusive course here. The ITIL® Foundation Course introduces participants to the phases and supporting processes and functions of the service-lifecycle approach to IT Service Management according to the ITIL® framework of best practices. There are no prerequisites, except at least 1 year experience working working in an IT environment. The IT Infrastructure Library® (more commonly referred to as “ITIL”) is centered around five books published by The Cabinet Office: Service Strategy, Service Design, Service Transition, Service Operation and Continual Service Improvement. Taking an ITIL Foundation course is like getting the Readers Digest™ of these volumes in a presentation format. This three-and-a-half day (26 hours total) course provides an awareness-level understanding of ITIL concepts though lecture, presentation, and discussion. The 28 ITIL processes and four functions are described, as well as their goals, objectives, benefits, roles, and interdependencies. Download the course outline for this exclusive course here. Training for knowledge vs. training for a certification « Knapp I.T.